Terrible thing to say Mick! But thanks for the laugh! Paul: Columbo was great (but can't get my girlfriend into it!). But, did he really have a wife? He told such fascinating stories about her but I don't ever recall her being seen on screen... Maybe she looked like that Matron you described! I just had to look up who Margaret Rutherford was! You're right, such a fine looking woman but surely not enough facial hair for your own good tastes?! Right, off to do some modelling stuff! Remember Mr Price, I'm in charge and you do as I say: go build an LNER layout! First up is a picture of the front end of the K3s. I had a bit of a moment thinking what would Dr Al do now and then it hit me, lamp brackets! The I did the D49 (Shire). I also drilled out some holes to fit the hand grabs at the front end - luckily I remembered to do this before fitting the lamp irons! 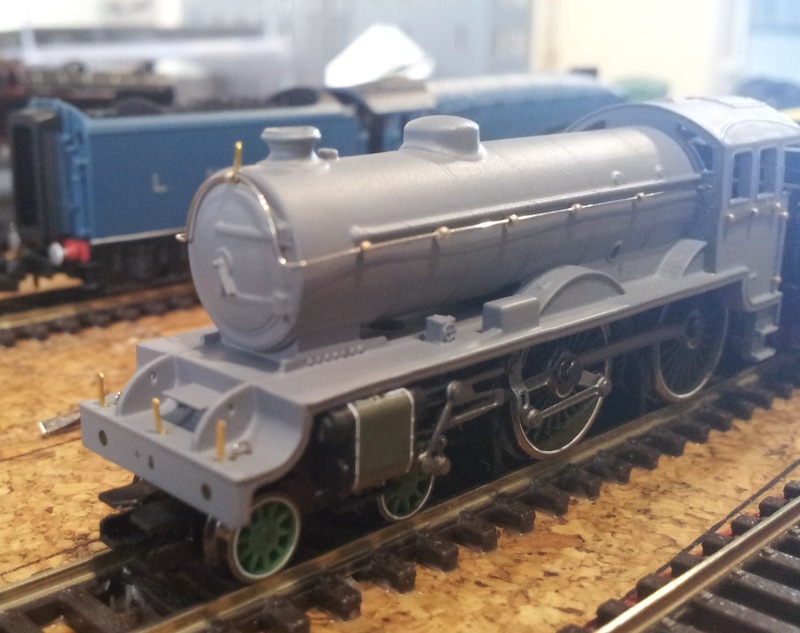 This just about completes the detailing for these three locomotives prior to painting. I'll be added vac pipes and coupling hooks afterwards. 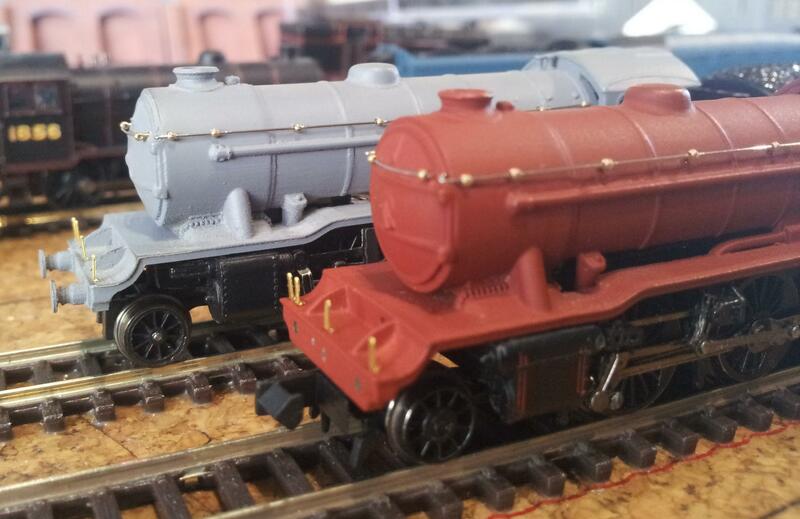 Size matters - especially if you don't have a lot of space - and N gauge is the answer! Thank you Bob! However, I think that credit is due to the likes of Dr Al, Gareth (thebrighton), Paul Price, Hailstone and a host of other excellent modellers, both here and elsewhere, who inspire and push me to try new and crazier things! Somebody has suggested that I add the piping to the lubricators, however considering that I'd need to add at least six pieces of 0.1mm brass wire to a small box around 2mm cubed, I think that this is one to accept won't be happening! 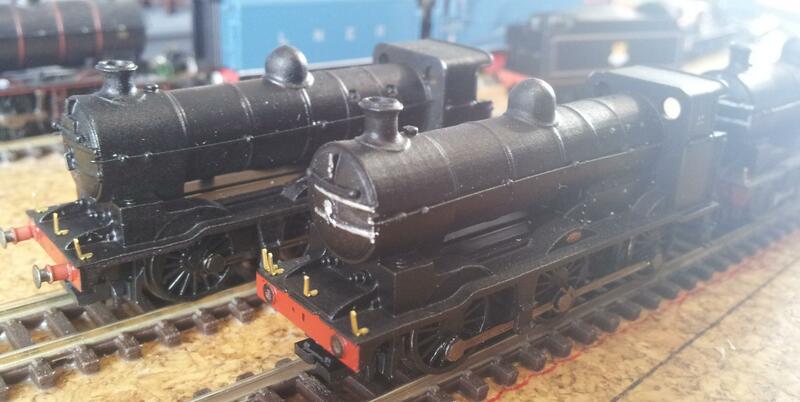 Things on the K3s and D49s is progressing rapidly and I'm fast approaching the point where I'll need to be altering the D49 Hunt class's valve gear to create a representation of the rotary cam valve gear. This is something I'm going to have to approach with more than some trepidation as it is a very distinctive part of the overall look of the locomotive and I don't want to wreck the bits of valve gear I'd like to keep. Still that's (thankfully) still something for another day, I've still got lamp brackets to fit to that particular locomotive today! Ok, this mornings efforts... You will be forgiven if you think you're reading the 'Tales of Doom' thread (minus the incredibly witty writing style of that poster!) with this. Well it's a bright new day and I was looking forward to a repeat of my first ever lamp iron fitting experience yesterday... Off I go merrily cutting off the lamp irons I'll need for the D49 Hunt class and, just as I've finished this, I realised that I hadn't drilled the holes for (and fitted!) the front hand grabs! Bleeding stopped and I drilled the next three holes without incident... Wait a minute.... What happened to those lamp brackets??? I'm sure that there was four a moment ago but now there is only one! ...the air once again turns blue... I thought at this point I'd better leave cutting more off until I'm done bending up the wire for the hand grabs. For handrails and such like, I prefer to use 10 thou electric guitar wire. While it is a bit more difficult to bend to shape, it is very strong and takes a lot of abuse before distorting once on the model - I cut myself a length of wire and make the first 90 degree bend. Now the next bend is a bit more difficult as it is less than 3mm away from the first bend and I've not got any pliers that are thin enough for this. Yesterday this wasn't a problem as I found that I could make the bend successfully by hand... (Anybody want to guess what happened next?) OUCH!!!! The wire slips from my grip and pings into my hand causing a nice scratch around 2 cm long which then proceeds to bleed profusely! The air turns blue... AGAIN! Bleeding stopped and me starting to feel like I'm Reg Prescott trying to demonstrate DIY on the Kenny Everett show, I have another go at bending the handrail (much more carefully and I was thinking of putting the welding gloves on but then decided that it was probably better not to damage them!). Success! One hand grab formed! Holes glued (incidentally so was the scratch to stop the bleeding!) and handrail fitted! Next handrail... bends successful... offered up to the model, it fits... trim to length using wire cutters... both ends covered with bluetack to prevent pinging OUCH!!!! The wire cutters cause one of the excess lengths to shot straight through the bluetack (normally such a good safety measure!) and into my finger (about 5mm in)! Blue air decided it's not bothering to go away this time as it keeps getting called back!!! After this things get boring as it was actually plain sailing for here. I rarely injure myself modelling but the D49 seemed determined to make up for that today! I have literally shed blood and tears (but no sweat yet) over this model and my skin is very much wondering if it should following the blue air's example and leave me to pursue a new career as a collender! So, without further ado, the detailed front end of the D49 Hunt! Reg Prescott - probably my favourite character from my childhood It's a dangerous hobby isn't it although my injuries are normally soldering iron related trying to solder very small bits together. Gareth, great to hear from you! How have you been? Reg Prescott was a favourite of mine as well as a few friends from school - unfortunately as repeats as dear old Kenny had been gone a couple of years by that point. Yes, the hobby is dangerous and I've had some incidents in the past! However, I've never had such consistent misfortune while carrying out one fairly minor task before - I thought I should write about it! Soldering is painful and while I've so far not managed to drop the iron on me or touch it be its hot bit (so far anyway! 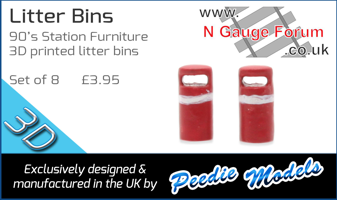 ), I've have managed to gain some lovely raw finger ends from holding bits of metal and dwelling with the iron that faction too long on several occasions! Soldering is a fairly new skill to me and I still have moments where two pieces of metal just don't want to be joined. However, this is always my own fault and I'm now capable of figuring out what I'm doing wrong on most occasions. Please tell me that you are working on some new and wonderful model again! Ha I can beat you on that, I can now only use my soldering iron under the supervision of the Domestic Overlord and all because I had a little miss-hap that could have happened to anyone. Let me set the scene, I was allowed a little freedom, normally when this happens I don the blue face paint, grad a skirt from the dressing up box, and come over all Scottish. Anyway on this occasion I thought sod the make up I would get down to some serious modelling. So out came the soldering iron and I set off to work on the fiddle yard, anyway after a while I was happily in my little bubble and the mobile rang. You can guess what happened, no before you say it I did not put the hot iron to my ear, THAT WOULD BE STUPID. I put on my posh phone voice and answered the phone, after a minute or so I got this massive craving for a Bacon sandwhich, which I thought was strange, but I could just not get the smell of bacon out of my head. Then I noticed I had put the hot iron in my jeans pocket. THEN THE PAIN hit me, nearly as bad as the embarrassment of hobbling downstairs to admit to the DO what I have done. Pity really I like those jeans, anyway ever since then as soon as I smell bacon cooking I get a strange twitch. Mr Price, what are you like!? That reminds me on an unfortunate incident back at secondary school which, thankfully, did not involve me! Metalwork class and we've been having to do some brazing (or heating for bending - this was twenty years ago!) of some metal pieces. One chap took his nice glowing red piece of metal and then got distracted by another friend and they got into a chat. He then absent mindedly put the metal down on the desk and turned back to his mate (who also wasn't me). Now, back when I was at school, and I'm sure this is the case with every child at every school since time began, we were forever getting told off for sitting on desks and talking... I'm sure you can work out the rest. We never did let him live that down and the teacher never forgave him for scorching the workbench by putting red hot metal down on it! Goodness Mick, at least I managed to start some actual work before injuring myself! I do hope that you are ok though. Right back to some modelling - we'll see how long that lasts on this thread today!!! The eagle eyed among you might notice a couple of differences between the two leading J6s (assuming you can make out anything from my poor photography effort this morning. I've also got a plausible explanation regarding the four lamp irons above the buffer beams of certain locomotives. It would appear that this was a GNR feature that continued on LNER built locomotives to GNR designs. However it would seem, from photographs that some locomotives had these reduced to only three during works visits after 1928. As with most things to do with the LNER this seems to have been haphazardly employed. 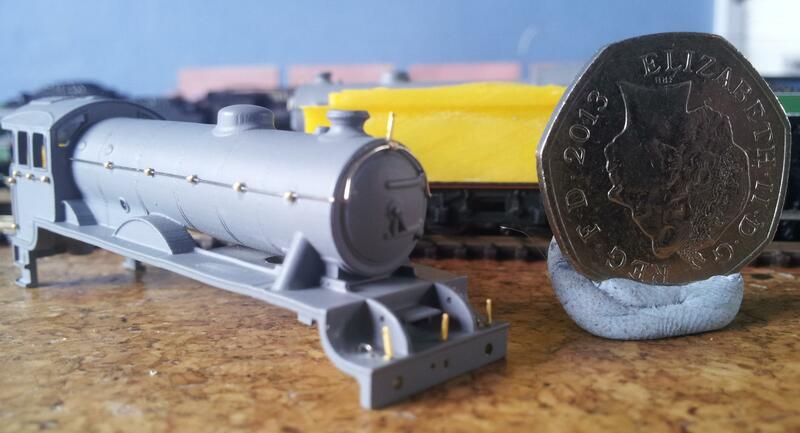 In other news, I think I've crack the tender design for the D49s! Fingers crossed the print (finally!) fits the tender frames so that I can work to catch that end of the locomotives up with the front! Page created in 0.202 seconds with 39 queries.